OPP4215 is a rugged RFID tags in the industry. Simply put: we offer the largest selection of industrial RFID tags and visual tag solutions available. But more importantly, we work closely with our clients in various industries throughout the world and have been a major provider of RFID in harsh environments for many years. Through our experience we know what works, and what doesn’t. Even as opportunities are increasing, compliance requirements, capital investments and global competition continue to pressure your margins, processes must be leaner. Recently, we published a customer success story on how digital automation using RFID is transforming the business of extraction which is one example of our capabilities and how RFID technology can help you manage your assets from beginning to end. Read the Success Story now. OPP4215 RFID tags can help you identify and locate 100,000 or more assets — even across an industrial yard spanning several square miles — so you can more efficiently manage your operations, inventory tracking, forecasting, and compliance. But to count the many, or locate the one, make sure your RFID tags meet the specific demands of your environment: whether you’re dealing with sub-zero temperatures or sweltering heat, exposure to seawater or extreme sunlight, challenging terrain or physical obstructions, or other factors. We thoroughly test our RFID tags in real-world situations and extreme conditions. So yes, we’ve made the “sledgehammer proof” RFID tag (or as our engineers like to say, a tag that has been rigorously compression-, torque-, and crush-tested). As a best practice, make sure your RFID tags are tough enough to withstand whatever the weather — or drilling pipes, shipping containers, operators or other heavy objects — may throw at them. When munitions or other kinds of explosives are involved, make sure your RFID solutions are certified (ATEX, C1D1, C1D2, and IECEx). And make sure you can specifically customize your passive RFID or active RFID tags with static-discharge coatings for example, to meet (or in this case, very much exceed) your specific safety requirements. And when it comes to using RFID tags around explosives, don’t be shy about asking for certification, compliance materials, and test data. We’ve done a lot of testing with our high-temperature RFID tags: freezing them, then heating them up to 280°C, and then repeating the process over and over again). But every RFID application is unique, like applying RIFD tags on the automotive assembly line while the paint is baked on. 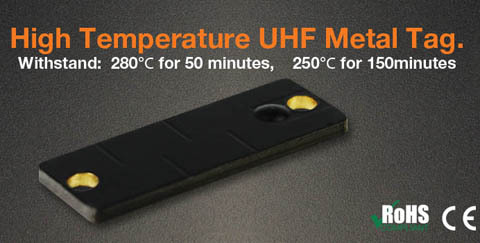 So make sure that your high-temperature tags (and their specific shape, size, coatings and adhesives) have been thoroughly tested for the high temperatures and extreme heat involved in your particular application. These applications often involve harsh environments, high-temperatures or explosive environments, with their own unique challenges, such as the active RFID applications used by utility providers and our other clients in the energy industry. For the utmost safety and reliability in pipes, casings, drill collars, underground lines or similar equipment, make sure your RFID tags fit — and can withstand the heat, friction, and other harsh elements involved. Sometimes an RFID tag must do more than just identify or locate an asset. So when using RFID tags to encode more data, make sure you choose the right kind of high-memory RFID tag — with the right amount of memory, to cost-effectively store the asset data you need — whether you’re using RFID tags for IT asset management, military transport vehicles, retail supply chain management, or other applications, like transforming paper labeled boxes into smart containers. Wi-Fi, hand-held radios — even the microwave in the breakroom — all of these things can interfere with RFID applications, whether active RFID tags or passive RFID tags are involved. That’s why it’s important to thoroughly test your RFID tags in real-world situations: across the entire industrial or construction yard, or throughout a sprawling 2.4 million square-foot manufacturing facility, and especially in areas with excessive signal noise and signal interference — even at lunch time. Getting the right kind of RFID tag, with the right materials, coatings and adhesives is critical for deploying tags in environments involving chemical exposure. And it’s critical that your RFID tags can withstand individual chemicals — but also the potential chemical combinations — whether just a splash, or repeated exposures, or submersion, again and again. And when using RFID tags for instruments at medical facilities, for example, it’s also critical to consider contamination factors. Sometimes harsh environments have nothing to do with snow, nor rain, nor heat. The retail, manufacturing, logistics, and transport industries are harsh enough — especially when it comes to verifying that your goods and materials are authentic — and preventing them from being tampered with, physically or digitally. When dealing with counterfeiting and tampering, it’s best that your RFID tags can prevent or identify tampering with the tag itself — and also protect the tag’s data with proper encryption, no matter where your goods, supplies, and merchandise may be in service or in the supply chain. So when it comes to the big picture, and using RFID in harsh environments, it’s more than just getting the right kind of tag on the right frequencies. Make sure your RFID tags have been thoroughly tested to meet your specific conditions. And don’t be satisfied with an RFID tag that can’t stand up to your worst-case scenarios, especially in harsh environments. And even the best passive RFID or active RFID tags won’t matter, if you don’t have the right RFID tag readers — whether manual, automatic, or mounted on a drone (yeah, we’ve done that). Ultimately, you want a proven RFID strategy — with the right RFID tags and labels, tag readers, software, infrastructure, and RFID technology all in synch — especially when deploying an RFID technology in harsh environments.